Our Qt software development offer plethora of functionalities required to develop advanced GUI applications on embedded platforms or desktops. ANGLER Qt software development is a comprehensive framework that includes an extensive array of features, capabilities and tools that enable development of High-Performance, Cross-Platform Rich-Client and Server-Side applications. ANGLER’s Offshore Development Center (ODC) services offer you rich user experience and go the extra mile in meeting client satisfaction. ANGLER Technologies offers Qt software development to customers world wide in India, USA, Singapore, Hong Kong, The Netherlands, UK, Dubai, Canada, and South Africa. At ANGLER have a team of quality Qt programmers in India offer you with a plethora of functionalities required to develop advanced GUI applications on embedded platforms or desktops. Qt makes use of native graphics APIs of each platform it supports, making the most of system resources and ensuring that applications have native feel and look. Visual Studio 2005, Visual Studio 2008 and Xcode on MAC. Cross-Platform Applications: ANGLER under its ODC offering develops native cross-platform applications using Qt API tools. This cross-platform API lets programmers concentrate on value-adding innovation, instead of focus on routine maintenance and administration and interfaces for multiple versions of existing applications. Network Based Applications: Using the well-developed network classes of Qt, ANGLER develops TCP and UDP based network applications as well as higher-level classes that implement the client side of the HTTP and FTP protocols. WebKit Based Applications: Using the well-deveolped wetkit classes of Qt, ANGLER develops web-based container applications. ANGLER as a quality Offshore Development Center is providing talented, dedicated developers for developing Qt applications in Windows / Mac OS X / LINUX. We have dedicated Qt Application Development team with extensive experience in C / C++ language with object-oriented programming capabilities in sophisticated Development Environment using Visual Studio, Xcode and Qt Creator with full functional knowledge base to meet the customer expectations with our Offshore Development Center (ODC). 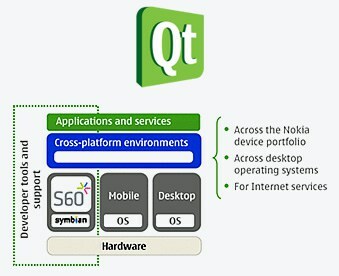 Our Qt development team is expert in developing the Qt applications for diversified industry verticals. If you want to develop any outstanding application for Cross Platforms (Windows / Mac OS X / LINUX), hire our Qt Application Developers; we assure you to provide the ultra modern Cross platform desktop applications with superb quality and great scalability. Our highly skilled Qt developers are efficient in C / C++ / Qt programming and well versed with Windows, Mac OS X and LINUX. We have developed several small to complex Qt application able to run efficiently on cross platforms (Windows / Mac OS X / LINUX). Contact US today to know more about our Qt Application Case Studies or to hire our Qt Application for your needs.